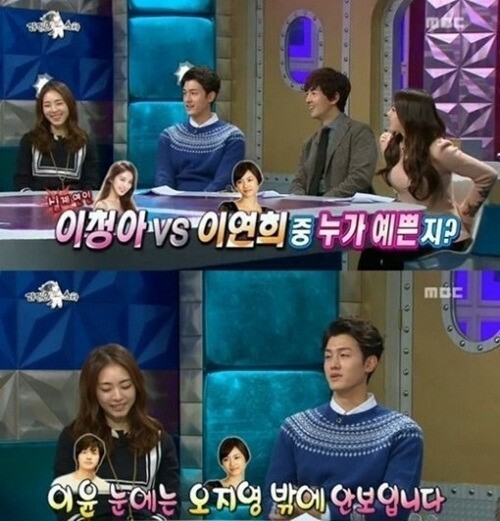 Actor Lee Ki-Woo’s comments about actress Lee Chung-ah and Lee Yeon-hee on the MBC entertainment show “Radio Star” have been widely circulated in the online communities. In the show, aired on Wednesday night, actor Lee was asked who is prettier -- his own girlfriend Lee Chung-ah or co-star Lee Yeon-hee. The 34-year-old star responded that Lee Yeon-hee looks prettier when he is playing his role in the drama. “I have never been so immersed in acting as this,” he was quoted as saying. Lee Ki-woo and Lee Yeon-hee are now starring together in the MBC drama “Miss Korea,” featuring a middle-aged man who strives to make an ordinary girl Korea’s top beauty, Miss Korea. The actor confirmed that he was dating model-turned-actress Lee Chung-ah in April last year.